Chemical leucoderma (CL) occurs after repeated topical or systemic exposure to a variety of chemicals, usually without preceding inflammation. The majority of these chemicals are aromatic or aliphatic derivatives of phenols and catechols. 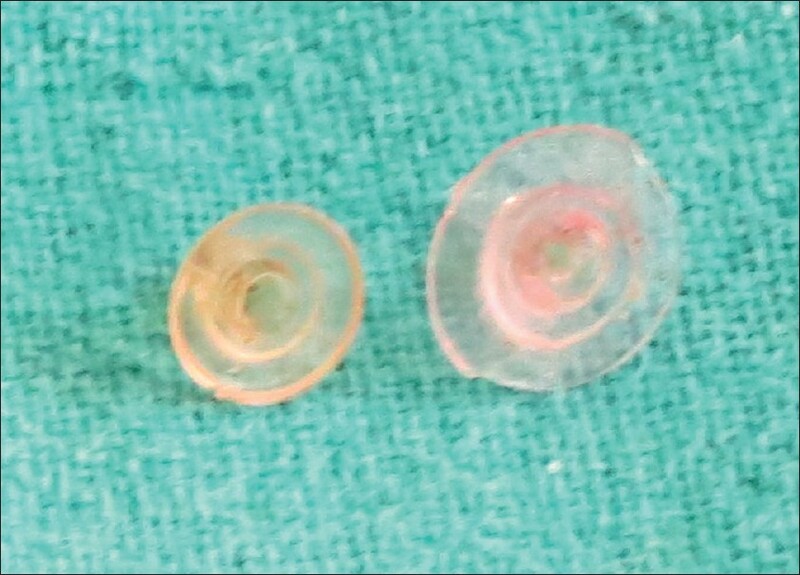 Herein, a case of CL secondary to ear-ring stoppers made of polyvinyl chloride (PVC) is illustrated. A 15-year-old girl presented with a patterned depigmentation over the back of both ear lobules of 2 months duration. She had been using plastic ear-ring stoppers for approximately 6 months. There was no history of preceding erythema or itching. She refused previous history of spontaneous depigmented lesions on her body or in family members. 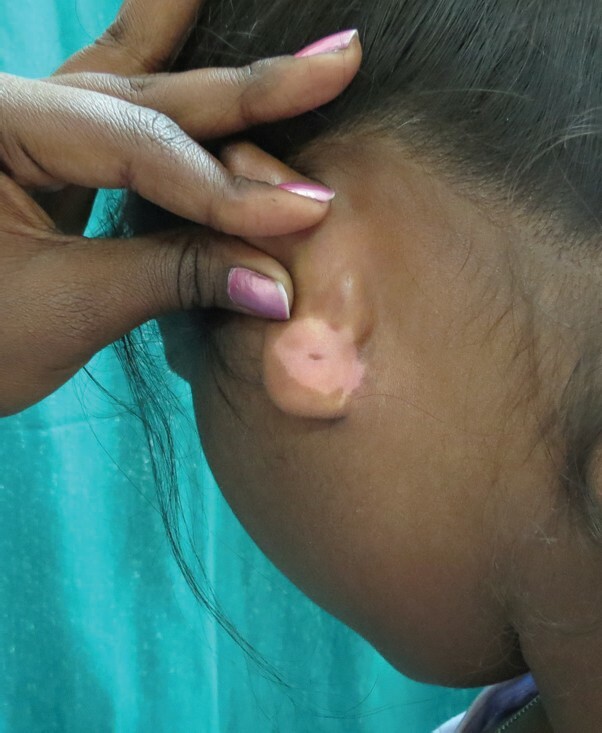 Examination revealed well-defined circular areas of depigmentation, symmetrically involving back of both ear lobules and extending to the immediate retroauricular region, with no signs of inflammation or change in skin texture [Figure 1]. The location of the lesions almost corresponded to the site of contact of the plastic ear-ring stoppers [Figure 2]. Standard patch testing was done with the Indian standard series and cosmetic series of allergens (Chemotechnique), approved by the Contact and Occupational Dermatoses Forum of India. It was negative after 48 h. The patient refused patch testing for extended duration for fear of possible induced depigmentation at the patch test site. She was started on topical 0.1% tacrolimus cream, but unfortunately she was lost to follow-up. PVC content in the stoppers was confirmed from the manufacturer. PVC, an inexpensive thermoplastic, is a widely used plastic. It is made by polymerisation of the vinyl chloride monomer. The final PVC products, when completely cured or hardened, are generally considered to be inert and non-hazardous to the skin. However, there are a number of additives included in the final PVC products such as plasticisers and stabilisers, as well as molecules of the monomer. Di (2-ethylhexyl) phthalate (DOP), butyl benzyl phthalate and di-N-butyl maleate are used as plasticisers for soft PVC. These plasticisers are known to cause contact dermatitis and contact urticaria. However, after a meticulous search on PubMed and Medline, only three reports of PVC-induced CL have been found. Kim et al. reported CL with oxygen nasal cannula containing both PVC and plasticisers like DOP, dibutyl phthalate and diethyl phthalate. Frenk and Kocsis  reported a case of depigmentation from adhesive tape made of PVC with a natural rubber adhesive base that contained a derivative of dihydroxydiphenyl methane. Stethoscope earpiece containing PVC and phthalates has been reported to induce contact depigmentation. It would have been interesting to know what plasticisers were used in its manufacture, but the facility was not available in our institution. Though the exact mechanism of PVC-induced depigmentation is not known, it has been mooted that PVC causes CL following prolonged contact. Treatment options of CL include discontinuation of the offending agent, topical steroids, tacrolimus, oral steroid pulse, phototherapy (narrow band-UVB, PUVA), etc. Resistant cases needs to be managed surgically. Techniques of surgical repigmentation involve the transfer of melanocytes, melanocytes and keratinocytes, or full-thickness skin from normally pigmented areas to hypomelanotic patches. Autologous skin grafts can be divided into three major groups: (1) grafting of normal skin (epidermis with or without dermis) that contains melanocytes, (2) grafting of a noncultured epidermal or hair follicle suspension that contains melanocytes, and (3) grafting of cultured melanocytes with or without keratinocytes, in suspension or as sheets. In this case, the patient was advised to use the metallic stoppers instead of the PVC ear-ring stoppers. PVC ear-ring stoppers are in vogue among girls/women as a substitute to the precious and expansive metals like gold or silver. This is the first report of CL induced by plastic ear-ring stoppers. In future, with increasing use of PVC ear-ring stoppers in precious as well as imitation jewellery, dermatologists are more likely to encounter this patterned depigmentation, and therefore it is imperative to take cognisance of this new pattern and cause of CL. 1. Rietschel RL, Fowler JF. Paraesthesias due to contactants. In: Rietschel RL, Fowler JF, editors. Fisher's contact dermatitis. 6 th ed. Ontario: BC Decker Inc; 2008. p. 470-83. 2. Pandhi D, Vij A, Singal A. Contact depigmentation induced by propyl gallate. Clin Exp Dermatol 2011;36:366-8. 3. Ghosh S, Mukhopadhyay S. Chemical leucoderma: A clinico-aetiological study of 864 cases in the perspective of a developing country. Br J Dermatol 2009;160:40-7. 4. O'Reilly KE, Patel U, Chu J, Patel R, Machler BC. Chemical leukoderma. Dermatol Online J 2011;17:29. 5. Ghosh S. Chemical leukoderma: What's new on etiopathological and clinical aspects? Indian J Dermatol 2010;55:255-8. 6. Singh P, Singh J, Agarwal US, Bhargava RK. Contact vitiligo: Etiology and treatment. Indian J Dermatol Venereol Leprol 2003;69:27-9. 7. Kim YY, Kim MY, Park YM, Kim HO. Nasal cannula-induced chemical depigmentation. Contact Dermatitis 2006;55:113-4. 8. Frenk E, Kocsis M. Depigmentation dye to adhesive tape: Ultrastructural comparison with vitiligo and vitiliginous depigmentation associated with a melanoma. Dermatologica 1974;148:284. 9. Srinivas CR, Mukhi SV. Stethoscope earpiece-induced chemical depigmentation. Contact Dermatitis 2003;49:110-1. 10. Bajaj AK, Saraswat A, Srivastav PK. Chemical leucoderma: Indian scenario, prognosis, and treatment. Indian J Dermatol 2010;55:250-4. 11. Lotti T, Prignano F, Buggiani G. New and experimental treatments of vitiligo and other hypomelanoses. Dermatol Clin 2007;25:393-400.